Did you live in Queensland in the 70s and 80s and find yourself on the wrong side of the fence? We want to hear your story! 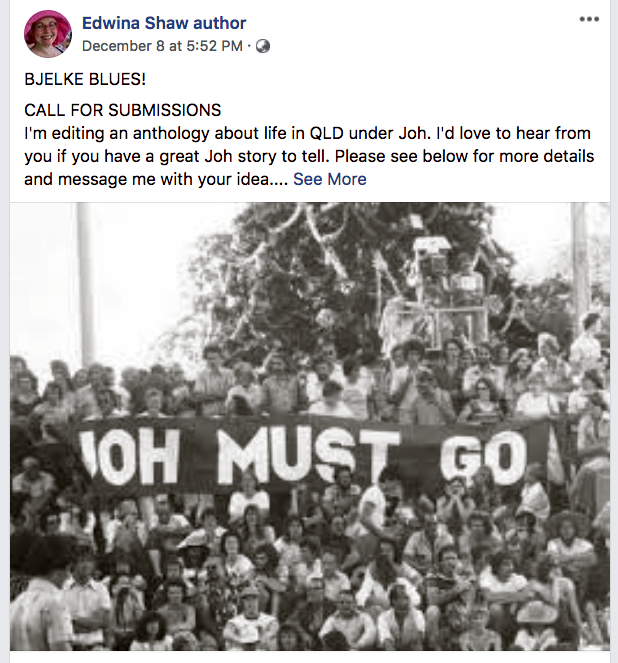 AndAlso Books is seeking submissions for a new collection about life in Queensland during the Bjelke Petersen era – Bjelke Blues. Whether it’s an anecdote about a street march or a longer piece about life during the time – whether serious, silly or surreal, non-fiction, memoir, or fictionalised— we’re interested. How did living under this repressive regime affect every-day people? If you have a compelling story to tell, we want to hear from you, whether you’re a writer or not. Editors will help polish pieces to publishable standard if you’re not a practicing writer. Stories should be from 300 – 3000 words. We want story ideas or outlines by 15 January. We need initial story drafts by 25 February. Bjelke Blues will be published in September 2019. Send outlines or stories to the anthology’s editor Edwina Shaw at kublershaw@optusnet.com.au. Early submissions and submissions from marginalised groups are encouraged.